Psychic Trance Fur - "Head"
From the opening spoken line, "What is this thing I call my head?," I immediately wonder on which side of the 'pretense or poignant' line this album will fall. It's the same question that one is faced with every new release from the Gong family (save Pierre Moerlen's jazz group), or anyone else that attempts to marry new agey music with transcendental poetic verse. To be honest, I am not really influenced by the intentions of the artist to inspire me with lyrics/poetry, and so only judge these works based solely on musical merit (with the voice, whether spoken or sung, as simply an additional instrument). In the end, the Utah-based duo of Dan Cracraft (aka Koda) and Darren Weight pass the test, and provide an enjoyable listen whether you can deduce any meaning from the Koda's cryptic lyrics or not. "Head" is for the most part divided into a vocal half and an instrumental half, but both halves are musically along the same lines, that being pleasant and spacey ambient music, heavy on synthesizers but with both acoustic and electric guitars and some piano...Often like extended intro's to Hogarth-era Marillion tunes you might say. Accordingly, it wouldn't be a stretch to lump Psychic Trance Fur into the New Age category with Kitaro and the like, but luckily the music stays fairly low in 'Tesh factor;' that is, Head doesn't sound so jaded and cheesy (or what I would call 'empty virtuosity'). And thankfully, the MIDI'ed synthetic percussion Weight uses in places is not too annoying. Most of the tracks are laid back and soothing with swashes of synth and spacey incidentals, but the occasional guitar solo helps to break things up. Koda plays very much in the Dave Brock style (his solo works in particular), never meaning to impress anyone with rapid-fire talent, but rather more as continuous gradual runs as if instead a lyrical line. Several of the vocal tracks (e.g., "Hike Like A Tree") are really poetry put to music, the kind of thing that Gilli Smyth and Harry Williamson (aka Mother Gong) have been doing for years now, though also with that jazzy sax dimension that's not present here. But frankly, Psychic Trance Fur does it better, as they don't go over the top into that 'pretense' domain...or at least, they don't 'sound' pretentious. As for the lyrics..."What happens in the wire when we make love on the phone? Do the electrons going your way embrace those coming mine?" (from "Electromagnetic Love"). OK, well that's just silly, isn't it, but so what? This is music, not one of those PBS specials where some inspirational speaker tells you how to improve your life through embracing your personal aura or something (while simultaneously removing wheat from your diet). [Though I'd imagine that Koda might accept the offer of videotaping for PBS a help session on 'personally experiencing psychic phenomena,' as he alludes to in the liner notes.] That's all lost on me anyway. The point is, if you value certain Hawkwind and Gong solo works (e.g., Blake, Brock, and Smyth/Williamson) for their musical merits rather than just as collectors' items, then Psychic Trance Fur is probably a group you'd also enjoy. And I'd include myself in that category, even though I still eat wheat and am thereby headed towards 'old age' instead. 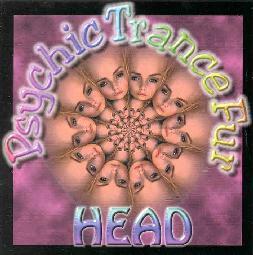 You can visit Psychic Trance Fur at their web site.